Yoshikazu Kato 1999 18 72 7179 45 minutes from Patong Beach. 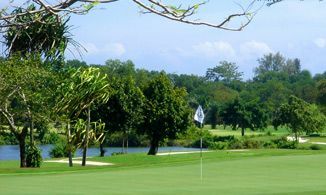 The Blue Canyon Country Club Lakes Course in Phuket is the second course at Blue Canyon, designed 1999 by Yoshikazu Kato and renovated during 2007. The greens are much wider than Canyon Course and the Lakes Course offers some of the largest golf greens in Asia. In addition the Blue Canyon Country Club Lakes Course has water hazards coming to play on 17 out of 18 holes. The signature Hole 18 is one of Asia’s best finishing holes in golf. The golfer got the option to end their final stroke onto the green from two platforms and a lone tree separates two totally different fairway options.